On the eve of the First World War, Zanzibar Town stood near the top of African Cities. In 1914 its infrastructure including harbor facilities, communication networks and housing resources, were clearly aspiring to make it a modern city. In terms of human resources its people were known for their industry, diversity and sophistication, the city was sometimes referred to as "the Paris of Africa." The government operated on a dual-rule model with the Sultan administering some facets of trade, civil order and Islamic laws; while the British controlled the most important city services, the military, and tax collection. In the two decades since the 1896 shortest war Britain’s connection to Zanzibar had been secured and expanded into a working, if uneven partnership. As war clouds began to gather in Europe that solemn November, the Islands and especially the Stone Town environs were solidly in the British camp. 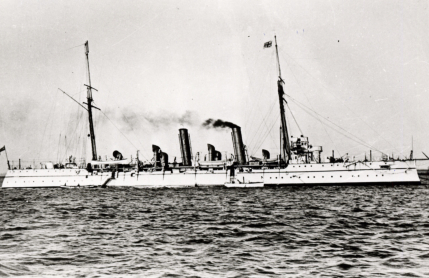 Word of the declaration of War between Germany and Great Britain was flashed to Zanzibar almost instantly via the underwater telegraph cable that had been laid to Stone Town from Aden in 1900. When the Zanzibari and British leadership meet to review the situation, they found their prospects grim. The leaders first lamented the almost complete lack of mainland coastal defenses save for the ancient Fort at Mombasa. Then the British military report noted: "Even more anxious was the situation in Zanzibar for that Island with no fixed defenses lay within 20 miles of the German coast .... a wealthy seaport .... Zanzibar was an obvious objective for the enemy." The Land Forces: Young men from the Zanzibar area were first enrolled in by the British army into a single regiment named the East African Rifles. 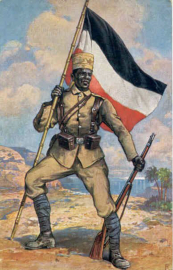 In 1902 this unit was reorganized as the 3rd Battalion of the newly created Kings African Rifles. The original compliment for 3rd Battalion called for 900 men; “300 Punjabis, 100 Sudanese, 300 Swahilis and a ‘mixed force’ of 200 men.” It is from among the last two categories that the Zanzibari men would have been recruited. Just a small detachment of the 3rd battalion was on Zanzibar that August, about 115 men. The bulk of the unit was posted on the mainland, and far to the north. 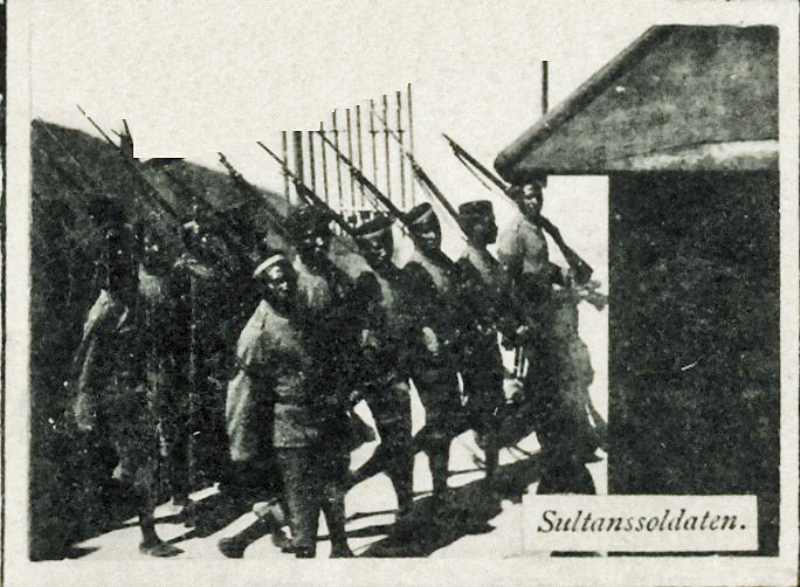 The only other troops in Zanzibar, when the war started were the Sultan's Palace guard. Perhaps the only positive note was the readiness of the local police constabulary in Zanzibar. It was thought that these well trained men might serve as non-commissioned officers in a locally recruited civil defense force. 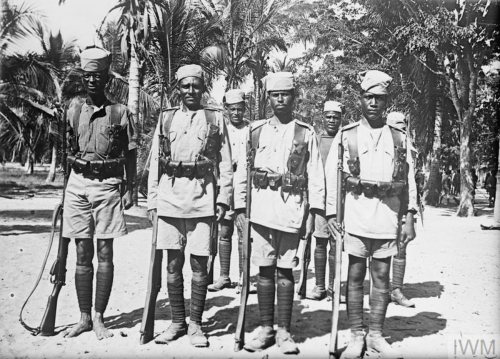 For the their immediate needs however, the British looked to the Indian Army to supply men for the defense of East Africa. They also looked to the Royal Navy to block any invasion threat to Zanzibar. Both of these plans were to be sorely tested in the coming fight. On the German side, the local land forces were more ready for war. The German equivalent of the KAR was the Schutztruppe. Established in 1889 this force had 25 years of experience fighting on home ground. They gained battle experienced during numerous coastal uprising, including the Abushiri Rebellion, 1888-1890, the HeHe War, 1891-1898, and the Maji-Maji Revolt, 1905-1907. However they lacked the and ammunition and material needed to fight a protracted war. Without re- supply they seemed unlikely to last long. Besides the direct military threat there was also a concern on Zanzibar about political unrest. 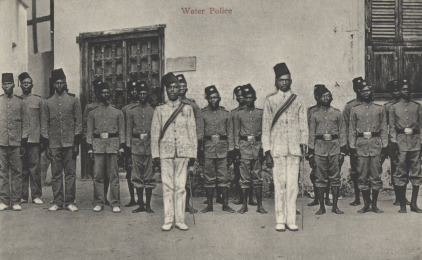 Most Zanzibaris had no love for the Germans, due partly to the many abuses and the occasional sacrileges reported by their coastal-mainland cousins. Still, there was a minority who might be spurred to action if the war went well for the Germans. The same British report noted this threat, "...a further risk lay in the fact that Sayyid Khaled, deposed from the sultanate ... years earlier, was living in (German controlled) Dar-es-Salaam and could claim many sympathizers in Zanzibar." Opening Acts near Zanzibar: One of the first acts of this first global conflict occurred in Zanzibar. Upon receiving the war alert on August 4th 1914 a Port Official on duty at the Zanzibar Harbor ordered the Zanzibar police there to seize the German registered Sea Tug "Helmuth" which was anchored near the German embassy. 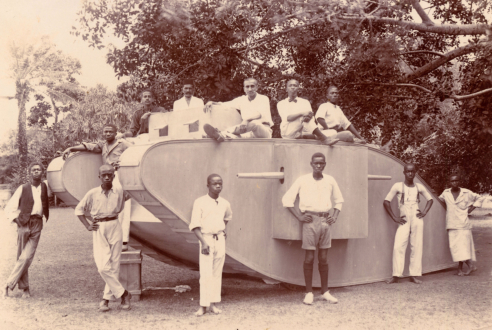 This ship was the only German vessel then in Zanzibari waters. The seizure of the Helmuth effectively cut off the only escape route for a number of German nationals living in the city. Most of these civilians were interned for a time and then repatriated safely. In these first days of the war there was a great zeal to take the fight to the enemy wherever he could be reached. On August 8th, while Europe still mobilized, the very first naval action of World War 1 occurred when the H.M.S. Astrae raided the Dar es Salaam Harbor. 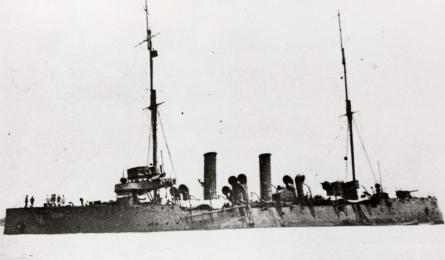 The Astrae destroyed the wireless station with shell fire and then sent boarding parties onto two anchored German merchant vessels, scuttling them both. 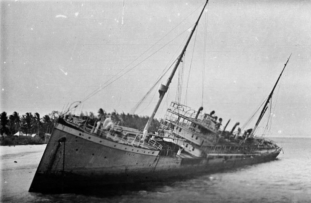 The Germans, fearing that the British might seize and use the Harbor, then themselves sank an additional ship (The S.S. Konig) in order to plug the harbor entrance. The next fortnight was spent by both sides in organizing and building up their defenses. The Germans in Dar es Salaam continued to worry about a British attempt to seize that city while the British worried about possible attacks on Zanzibar and/or Mombasa. It was during this time when both sides made efforts to recruit local coastal residents and form volunteer militia units. The four units most affiliated with Zanzibar and the Mrema Coast were: *The Zanzibar Rifles, *The Mafia Riles, *Wavell’s Arabs and *The Arab Corps. Three of these units fought for the British side. only one, “The Arab Corps” supported the Germans. The Arab Corps was raised in Dar es Salaam with the help of the ex-Sultan of Zanzibar Kaylid bin Barghash. These were all infantry units and all would take part in the fight but first a naval battle in Zanzibar Harbor would grab the world’s attention. 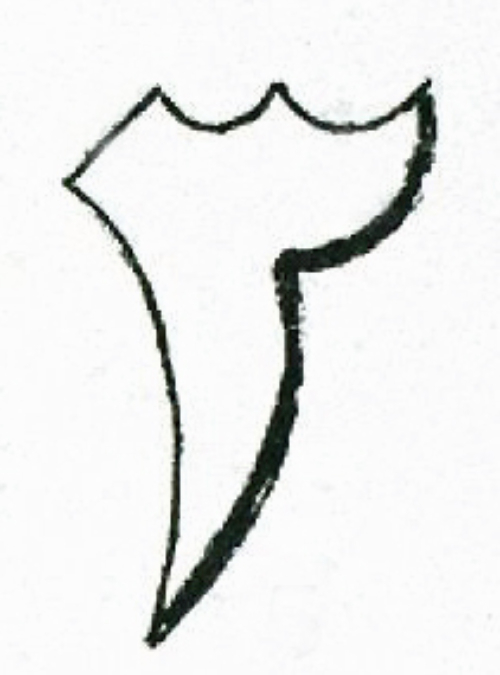 After H.M.S. Astrae shelled Dar es Salaam she moved south, away from Zanzibar. That left her sister ship, the H.M.S. 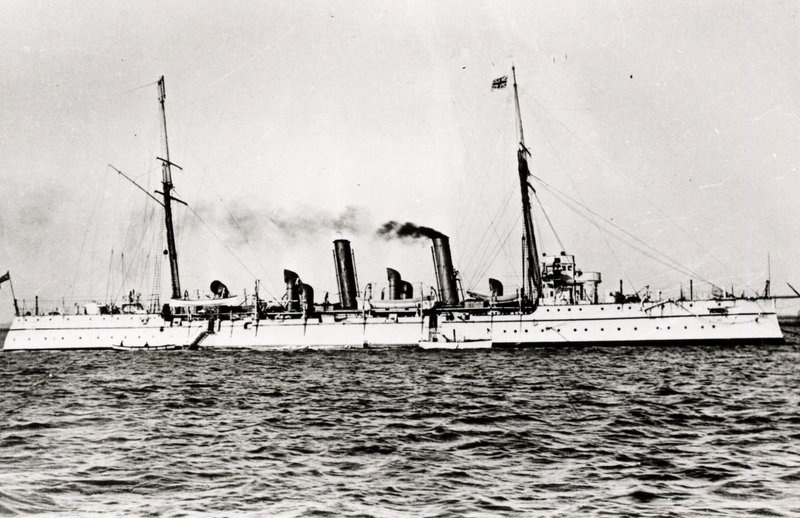 Pegasus, as the only war-ship in Zanzibar waters. The Pegasus too was eager to take the fight to the enemy, on Aug. 17 she raided the German held port of Tanga, (and disabled the German merchant ship Markgraf). On August 26th she raided the mainland town of Bagamoyo. The ship then retired to a defensive posting in the Zanzibar harbor. After 3 weeks of waiting the captain decided it was a good time to clean-out her coal fired engines. With her engines off-line she was presented a sitting target for the best warship in East Africa at the time, the S. M. Konigsberg. That German light-cruiser came rushing through the “French Pass” approach to Zanzibar City on the morning of Sept. 20. 1914. She opened fire with guns that were more accurate and had a longer range than anything the British had. In less than 10 minutes the stationary Pegasus was a burning wreck. The British captain (Commander John Ingles) struck his flag, indicating surrender. The Konigsberg reversed course, began laying mines near the harbor (mines which proved to be imitations) and then sailed away, without making any attempt to seize of shell the defenseless city. She did however, fire on the ex-German tug Helmuth, to which the British had added a small cannon and renamed the H.M.S. Helmuth. The tug was damaged but was later repaired. The shock of this loss sent a shiver through the British Military. Such a loss so early in the war was seen as bad for moral and therefore efforts were made to suppress and alter the news of the battle. 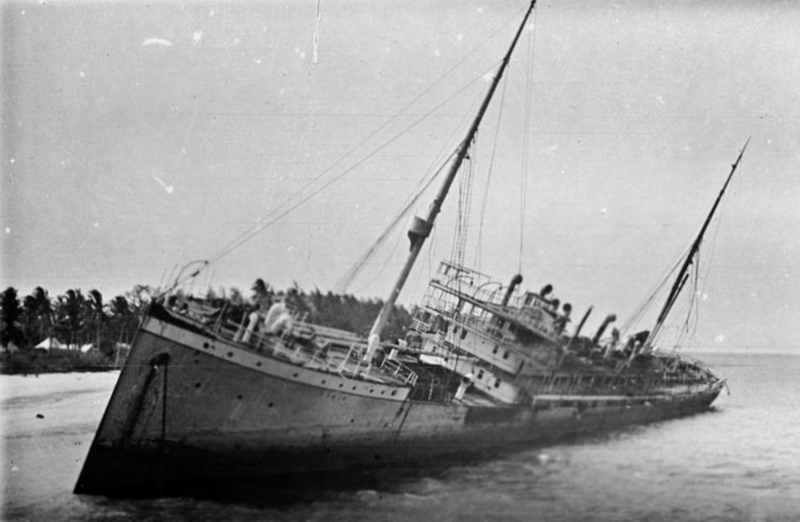 The ship was initially described as ‘disabled’ rather than sunk. 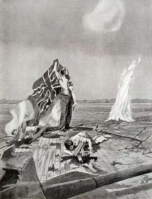 And even though the captain admitted to intentionally surrendering the ship a fantastic story of a lone sailor defiantly holding aloft a battered flag until he too was struck down, was circulated in hopes of generating patriotic fever. In reality 38 seaman on the Pegasus and one on the Helmuth died that morning. Many others were wounded. 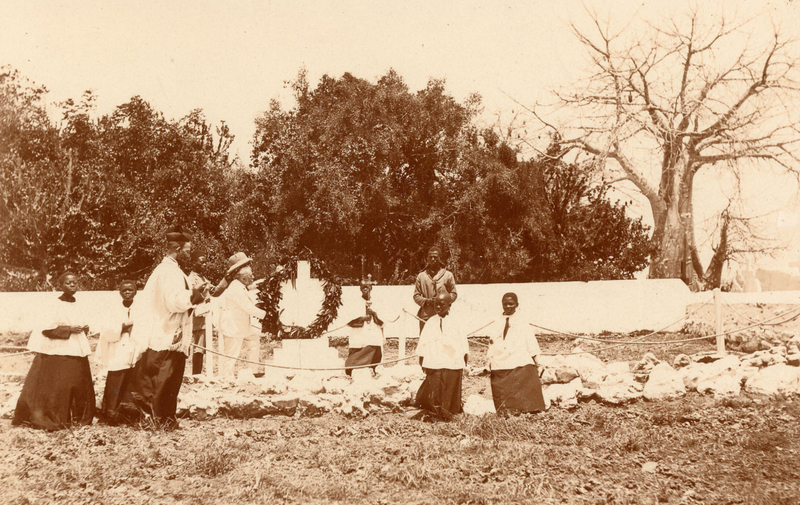 The dead were buried on a small isle in Zanzibar Harbor, That isle is still known today as Grave Island. 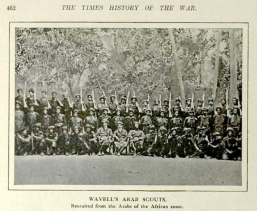 The Arab Rifles and The Arab Corps in battle. Even before all the British burials could be complete the Germans struck again. The next day, Sept. 21, 1914 some 500 troops, with 6 machine-guns, marched north from Tanga, out of German East Africa, along the coast and into British East Africa, arriving just south of Mombasa, at a town named Jasin. The dire threat this move posed to Mombasa cannot be exaggerated. Mombasa was then held only by a few KAR soldiers, the police and some British civilian volunteers, including some retired naval officers who reportedly set up a gun position in the old Fort Mombasa, using a modified signal cannon. However, Mombasa did have one unique force, one raised by a local Sisal farmer named Arthur Wavell. 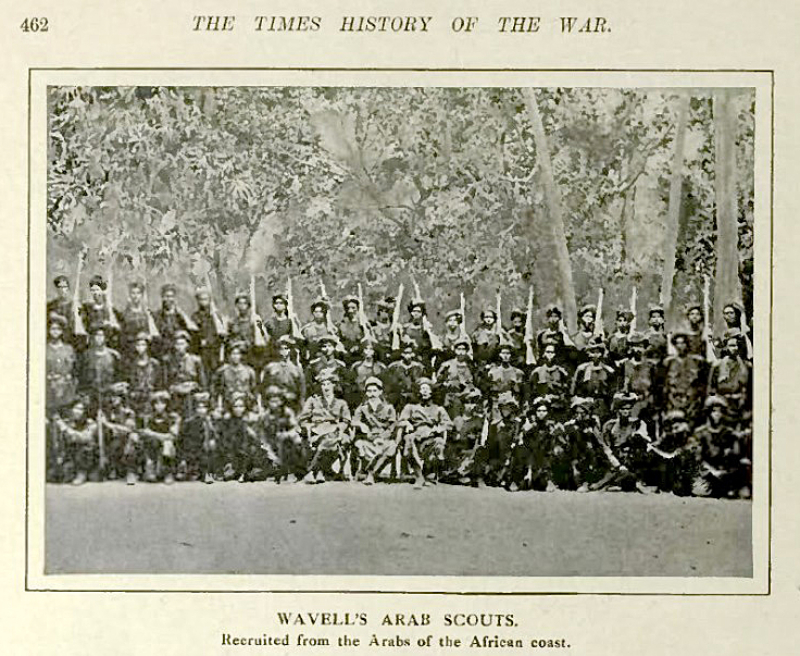 Wavell named this unit the Arab Rifles, but many others referred to it as simply as Wavell’s Arabs . He had recruited 200 Muslim men from the city, and pledged to train and equip them himself. Arabic and Swahili young men joined willingly, eager to serve with a commander who showed great respect and understanding of Islamic practices. 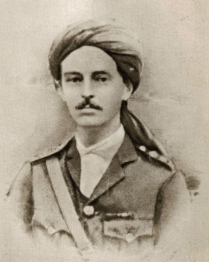 His interest in Islam began shortly after his arrival in Mombasa in 1905. 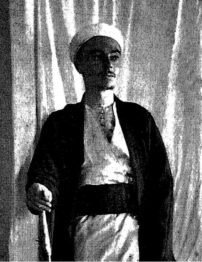 That interest grew and eventually he undertook a pilgrimage to Mecca, in 1908. When word reached Wavell that the Germans were on the march he and his men were encamped near the border, at a town named Majoreni. There the he and the Arab Rifles had already been in action. On August 30th, they had attacked and driven the German frontier guards out of Jasin town. Since then they had worked to improve the defenses around Majoreni. Now the Germans had reoccupied Jasin and were clearly preparing to attack. 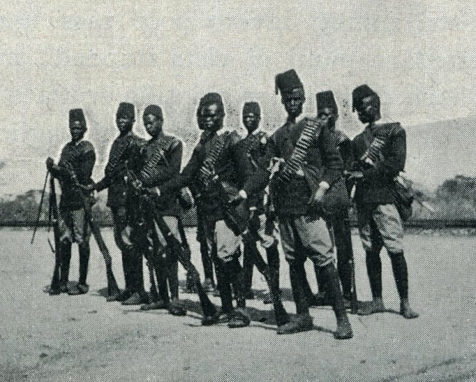 The battle of Majoreni started on September 22, 1914. The Germans deployed in two columns, one column crossed the Mwena river and pushed on to Majoreni where they encountered the mini-fort that Wavell’s men had thrown together in record time. There the Germans faltered, they hammered all day in vain at the British redoubt with their heavy machine guns. Mines hampered any German attempts to maneuver and they took casualties from the well aimed rifles of Wavell’s men. As night fell the Germans retreated, back south across the Mwena river. The Arab Rifles had held-out courageously and they suffered two men killed and seven wounded. Among the wounded was Captain Wavell, he received a severe arm wound. Moreover they lacked the ammunition to continue any further all-day battles. Therefore the Arab Rifles fell back the next day, further north toward the town of Gazi. Their rear guard was active, slowing and harassing the Germans who were on the march again, north toward Mombasa. These delays allowed the British time to rush reinforcements to the area. 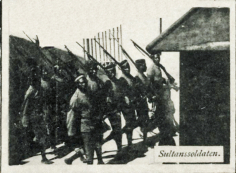 Troops from India had finally reached Mombasa. The 29th Punjab battalion immediately rushed 2 company’s south, they were soon joined by 2 KAR company’s, and finally Wavell’s battered Arab Rifles linked up to formed a defensive perimeter near Gazi, only 22 miles from Mombasa. The Germans attacked Gazi on October 7th, 1914. Four Schutztruppe company’s and the small Arab Corps, (coastal Arabs allied with the Germans) launched the assault through low bush country and across plantation fields. The battle raged all morning, with the Germans continuing to advance in the face of heavy fire. Then, just before noon the KAR men counterattacked. The Germans beat off that counterattack but their own advance had halted. While the Germans paused to reorganize the British withdrew to more prepared defensive positions and refreshed themselves briefly. Soon the Germans renewed their advance. But again the KAR men and the Arab Rifles sprang up and charged forward in counterattack. This time the German advance collapsed completely. By late afternoon the Germans were in full retreat. They never again were able to pose a serious threat to Mombasa. The men of the Arab Corps, fighting with the Germans, suffered a number of casualties in this action and they complained bitterly about their equipment. They were armed with obsolete rifles that were slow and fired black powder, that gave away their positions. Wavell’s Arabs were armed with modern rifles that fired smokeless powder. Many said that Wavell and his Arab Rifles had saved Mombasa. Wavell was promoted to Major and a public garden in the city was named in his honor. After spending some weeks in hospital Wavell rejoined his men, who were still defending the border just south of Mombasa. It was there, later in the war, that Major Wavell was killed in a German ambush. The Arab Rifles converted to a Reserve KAR company after Wavell’s death. As for the Arab Corps on the other side, they disbanded after their defeat at Gazi. After Gazi recruiting adequate replacements for that unit proved impossible.